EVA laminates are taking ground from PVB but if you’re installing architectural glass, which route should you go? It’s a numbers game. In the last three-years volumes of laminate glass production has increased according to analysts by anywhere between 16 and 24%. That’s substantial growth in anyone’s book. It’s also something which could accelerate further going forward. According to industry analysis, the use of laminate glass in architectural applications could top 40% by 2020, the majority going into commercial development. The use of laminate glass in a domestic setting is also on the rise. Staircases, balustrading, walk-on floors, have exploded the ‘glass ceiling’ for laminates in the metaphorical, if not the literal sense. “The demand for laminated glass has simply grown and grown”, says Simon Hares, General Manager, Cornwall Glass Highbridge. “The single biggest area of supply is balustrading. It’s something which has grown from use predominantly in commercial applications to see significant and continuing demand from homeowners. “We have supplied a number of other more specialised installations including walk-on-floors, glass ceilings and staircases, as well as partitioning and internal doors. “The general public certainly seems to have woken up to the architectural application of glass and by definition that means laminates”, he says. Tis increase in demand influenced the decision to install the groups new TEMA LPB 2536-4 Laminating oven. The 100K investment will enable flexibility to respond to the growing demands for laminated glass. 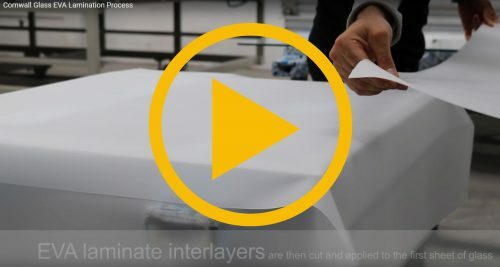 Why not take a look at the laminating process? Hares also points to Part Q as a driver of laminate growth. “While the requirement for security laminated glass only applies to new build – and then only accessible areas of the property – it’s also had an impact on replacements. 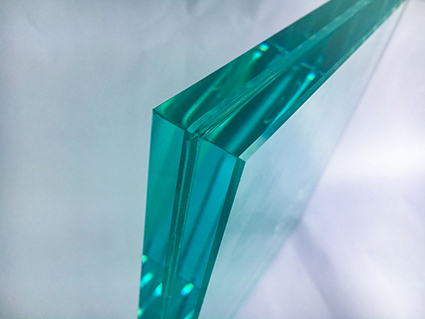 Traditionally PVB or Polyvinyl Butyral has dominated the manufacture of laminated glass, however, Ethylene Vinyl Acetate (EVA) film is now being used in increasing volumes. This is in part because it doesn’t require quite same levels of capital investment to set up manufacture but also because while matching the performance of PVB, in certain areas, it exceeds it. Cornwall Glass is among a growing number of glass processors to have tapped into EVA laminates’ potential. It made a six-figure investment in a new Tema LPB2536 laminated glass line in the summer. Installed at the glass processor and IGU specialist’s site in Highbridge, just outside Bristol, it supports Cornwall Glass in bringing increased flexibility to its laminate glass supply. This includes the capacity to process individual sheets of 2500X3600mm. “The flexibility to process big jobs is a real benefit, particularly those where by definition, we’re handling larger sheets, for example laminated glass floors or ceilings”, continues Hares. “It’s also from our perspective, simpler to manufacture, we haven’t for example had to invest in an autoclave. EVA interlayers are gaining ground on PVB according to commentators because its use in architectural applications offers a number of distinct advantages. These relate for the most part to adhesion. This has been a key contributor to the increased use of EVA laminates in balustrading. Hares continues: “You can’t build balustrading with a single sheet of glass for good reason because if it fails its game over. In laminating two sheets of glass you’re increasing its load baring capacity but also if a single sheet fails the other and the laminate is there to hold things together. “PVB does this well but EVA does it better, because it offers a higher basic level of adhesion. This is also a significant advantage where laminate glass is being used in external applications because of its resistance to moisture ingress. “The water vapour transmission rate for PVB according to studies, is around eight to nine times greater than that of EVA. What that means in real terms, is that EVA is far more resistant to water damage from weathering or exposure to moisture, than PVB”, he says. Hares argues that this is significant because where exposed to the elements, for example where PVB is used in balustrading, glass ceilings and walk-on flooring, water can penetrate the edges of the glass through capillary action. “You get the visual damage”, continues Hares, “if you look at a sheet of laminated glass that’s been exposed to the elements for a couple of years you can sometimes see delamination around the edges where moisture has been ‘sucked’ back up into the glass. “The same can sometimes happen internally, where water vapour permeates the glass causing delamination. “Visual damage may be an irritation and lead to call backs. More significantly water ingress can impact on the overall performance of the glass and the durability and mechanical resistance of the laminate and the glass as a whole. Architectural laminated glass products from Cornwall Glass Highbridge include balustrading; floor glass, including pedestrian walkways and bridges; walk-on roof glass; canopies; and staircases. These include standard double laminates, ranging from 17.5 to 21.5mm and 33mm triple laminates, for use in specialist applications, for example, walk-on floors and glass ceilings.